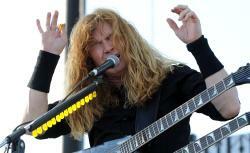 Megadeth frontman Dave Mustaine is accusing President Obama of, well, megadeath. The increasingly controversial heavy metal rocker recently suggested to a Singapore crowd of fans during a concert that the president is staging episodes of mass violence around the U.S. to pass a gun ban, citing the recent Aurora, Colo. movie theater shooting and the Sikh temple shooting in Wisconsin. Mustaine’s outlandish claim matches his cryptic writings—the thrash metal musician has become increasingly outspoken of his disapproval of the U.S. government on recent albums like United Abominations, and Endgame. Another long-haired shredder, Ted Nugent, was recently visited by the Secret Service after making comments deemed threatening towards the president. Hank Williams Jr. has also leveled criticism at the Obama Administration. Dave Mustaine of Megadeth suggested recently that President Obama was behind recent shootings as part of a conspiracy to increase gun control in the U.S.
Hey guys, it’s not too late: you could form a supergroup for the Republican convention later this month. Maybe Donald Trump and his Obama impersonator can sing and play tambourine?